This article appeared in the January 2019 issue of Police Chief Magazine, the official publication of the International Association of Chiefs of Police. A copy be accessed here. Law enforcement agencies previously unable to afford airspace technology, such as helicopters, can now affordably access drones to extend their security systems, monitor the skies and help them serve and protect citizens. According to research conducted by Bard University’s Center for the Study of the Drone, in 2018, there were more than twice as many agencies that own drones as there are agencies that own manned aircraft in the U.S. As of May 2018, at least 910 state and local police, sheriff, fire, and emergency medical services (EMS), and public safety have acquired drones in recent years. 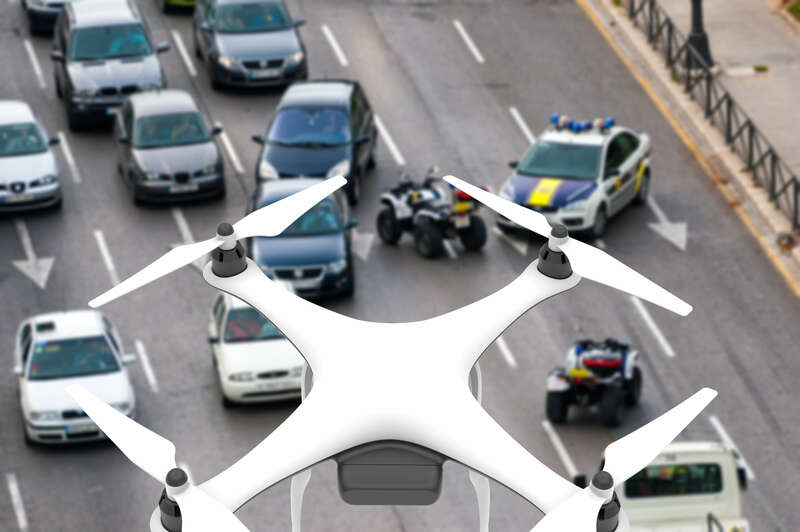 Law enforcement officials are using drones for crowd monitoring at major events, crime scene analysis, and for investigating active shooter or hostage situations. First responders are testing drones to deliver emergency medical supplies, such as defibrillators, to arrive at an accident scene. Firefighters are using drones to identify “hotspots” to target fire retardant drops at wildfires and enhance situational awareness. Any unauthorized drone is a threat, whether it's a hobby pilot unknowingly causing a nuisance, or a drone conducting hostile surveillance or dropping a weapon. Drone detection technology is used by law enforcement to provide an additional layer of situational awareness to the airspace. By using passive detection technologies, such as cameras and radio frequency sensors, law enforcement is able to capture data, understand drone activity near crime scenes, precincts or disaster zones, and locate unauthorized pilots. With drone detection technology, police can observe the behavior of the drone and institute defensive countermeasures to assess the threat and respond via direct contact with the pilot. This nuanced approach has evolved considerably from the initial inclination to find and neutralize the drone through a variety of offensive countermeasures. In all cases, whether the response to an incursion is to defeat or defend, it has become clear that early detection of drone activity is the critical foundation of any counterdrone program. Cities and local governments of the future will require monitoring of their lower airspace for consumer and commercial drones. Drone detection technology differs from defeat technology, but both are a part of a counterdrone solution. In all instances, passive drone detection technology, such as radio frequency sensors, cameras, and microphones, do not require additional legal permissions to own or operate. Drone detection is the foundation of a counterdrone program, as, without awareness of drone activity in the airspace, there is no way to target any passive or active countermeasure. A passive countermeasure could be protecting assets or people; an active countermeasure would be to defeat the drone using a weapon or jammer. Laws must be written to provide guidance on the procurement and use of both drone detection and defeat technology. The Preventing Emerging Threats Act of 2018, written within the 2018 FAA Reauthorization Act, is a starting point to begin this conversation with different industries that need airspace security in order to protect citizens and critical infrastructure. The Act is the first piece of legislation of its kind, which was designed to expand the authority of the federal government to use active counterdrone technology outside of military or combat zones. Active counterdrone technology defeats a drone, either by jamming the signal and forcing it to land or “return home,” or destroying the aircraft. Under these new laws, the U.S. DHS/DOJ can now use counter-drone technology at some mass gatherings, including National Security Special Events (i.e., Presidential Inaugurations), Special Event Assessment Rating events (i.e., Superbowl), or events requested by a Governor or head of U.S. State, Territory or district. However, security is generally executed by local law enforcement, and these agencies are not yet granted the ability to use counter-drone technology without the oversight of federal agencies. Drone detection technology can be quickly integrated into an observation post and a part of an investigative team’s security program. The FBI and other law enforcement use drone detection to identify single or multiple drone incursions, that may be from a single pilot or an orchestrated diversion or attack. This information will provide an additional layer of situational awareness to keep investigators focused on the rescue, rather than their own safety. At the 2017 International Boat Show in Ft. Lauderdale, local police coordinated with private security teams to monitor the lower airspace for drones. Enhanced physical security measures were in place and since the airspace above the event was as a restricted no-fly zone, local law enforcement added another layer of security by adding drone detection technology to their portfolio. Before the event, standard operating procedures for law enforcement and FAA response notifications were developed for all drone alerts and summarized in a UAV detection alert protocol. During the event, radio frequency detection, video detection, and surveillance provided the incident commander a robust overview allowing for preemptive mitigation of potential security and public safety threats from drones. As a result, drones were detected by the system during the show, capturing flight paths and drone information of unauthorized drones, and the security personnel were able to follow the drones and locate the pilot for further action with law enforcement. In Scottsdale, the PGA Tour coordinated with local law enforcement to use drone detection technology at a tournament attended by over 700,000 spectators. Scottsdale PD coordinated with PGA Tour security personnel, including members of the FBI, the Bureau of Alcohol, Tobacco, Firearms and Explosives, and the U.S. military. Specialized forces utilized the services of canine officers, explosive ordinance device technicians, and police on motors, bicycle units and mounted units. By flying drones near the event, pilots risked violating federal airspace laws designed to protect public events and a local airport, located only three miles from the protected site. A rogue drone would hinder the ability for Scottsdale PD and other security personnel to use aerial response in the event of an emergency. With drone detection technology, Scottsdale PD observed hundreds of intruding drones recorded over the 5-day installation, with over 20 drones detected within the first day of installation. Scottsdale PD actively monitored airspace activity and was able to protect PGA athletes, media, and attendees from drone interruptions every day of the event. Many law enforcement agencies are turning to drones to provide the next level of security. New software developed in 2018 uses artificial intelligence to detect violent actions in crowds, allowing for security to quickly respond to any threats. Emerging legislation is exploring how law enforcement may be able to use drones as a surveillance tool at public events. The FAA restricts flights over crowds, and in 2017, granted the first-ever waiver for a media organization to use a drone to film crowds. However, as uses for drones at public events becomes more common, it’s critical to ensure that if an unwanted drone is detected, the pilot is stopped and any threat is eliminated. Air traffic and connectivity systems for small drones at low altitudes are necessary for keeping skies clear for emergencies, to identify rogue or nuisance pilots, and to continue to protect sensitive infrastructure from airspace threats.